Inspired by the classic brown bag, this roomy carrier has plenty of room for a thermos, bottle of water, sandwich, fruit, and more. The bag’s flat bottom supports an upright structure and a padded handle on top makes it easy to carry. 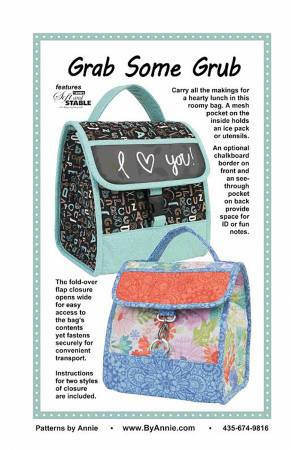 The fold-over flap closure opens wide for easy access to the bag’s contents yet fastens securely for convenient transport. An interior mesh pocket holds an ice pack, napkins, or silverware. A border of chalkboard fabric on the front can be used to identify the owner or offer a few words of encouragement for the day. If you prefer, substitute a coordinating fabric for the border. 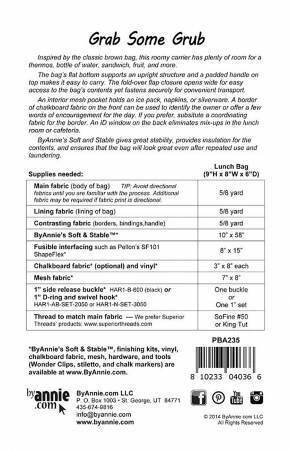 ByAnnie’s Soft and Stable gives great stability, provides insulation for the contents, and ensures that the bag will look great even after repeated use and laundering.